With that out of the way, let’s get to the movie. 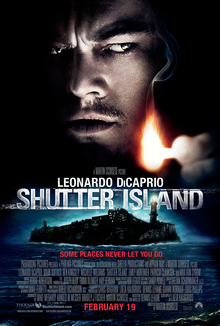 First off, it is based on a book, also titled Shutter Island, by Dennis Lehane. I bring this up because recently I’ve read books. Yes, plural! In the last 6 months I have finished FOUR books! Real books, not ones with pictures or pop-ups! The movie is set in the 1950’s on an island in the Boston Harbor. This island happens to house a prison for mentally challenged patients. A combination of mental hospital and federal prison where things aren’t always as they seem. Teddy Daniels (Leonardo DiCaprio) and his brand new partner Chuck Aule (Mark Ruffalo) are Federal Marshalls arriving at the facility to investigate a missing prisoner. Almost from the first foot on the island Teddy begins to complain of headaches and we see flashbacks with him. His flashbacks take him to his days in WWII in the military, including when the Americans took over the Dachau Concentration Camp. The images are striking. Seeing frozen and dead bodies piled upon each other is enough to make anyone sick to their stomach. As the movie progresses we see more and more from this camp that showed the traumatic experience any soldier of that time period could have been exposed to. We also begin to see visions of Teddy’s dead wife. Teddy tells us that she was killed in a fire set by a pyromaniac. One creepy flashback/walking nightmare shows Teddy holding his wife as she turns to ash. Teddy believes that his wife’s killer, Andrew Laeddis is imprisoned on the island, but no one seems to be willing to admit that Andrew Laeddis even exists. Talks of government conspiracies abound. As the story continues we see Teddy’s hands shake and his flashbacks/nightmares become stronger and it becomes hard to tell what is real and what is a vision. I felt the movie kept me on the edge of my seat all the way through to the end. Now, I am not going to spoil the movie (or book) for those of you who haven’t seen it. That makes it hard to continue on the storyline from the movie. There are twists and turns, some you will see coming and some you won’t. But in the end, I think you will like it, I did! I have to say now that there are a lot of disturbing images in the movie, especially to those who have children. Mothers may have a harder time at parts of this movie then I did. The movie also earns its R rating in blood and guts. In other words, this is NOT a kids movie. The movie’s soundtrack is awesome. I love it when the music builds and builds at intense moments of the movie. Sometimes it will build to the breaking point only for nothing to happen. For this being my first Leonardo DiCaprio movie, I was impressed. His acting was top rate. The film and story were immersive and I walked out of the theater slightly out of breath and going through parts of the movie again. Even discussing the ending with JC on our walk back to her place. I will give this movie 4 out of 5 and would recommend it to all the suspense thriller fans out there. Glad you are back to writing. Shocked that you haven’t seen ANY other Leo movies. I will NOT be watching this movie, of course, I had decided that just from seeing previews! I would like to recommend that you watch Catch Me if You Can.